Elaine Hancock (Olney, United States) on 25 March 2018 in People & Portrait. Une belle scène de l'hiver. A chacun sa taille de pelle. Adorable cette photo, chacun s'y met selon ce qu'il est, c'est cool ! C'est beau la neige, mais quel boulot, et on retire, ça revient direct. Seeing this makes me feel 'all is well with the world' :: it is not . . but a nice thought. Ah, the child is now learning how to work ! What a great team, the colours, theme reminded me a bit of Saul Leiter's . A fine captue of the two shovelers. 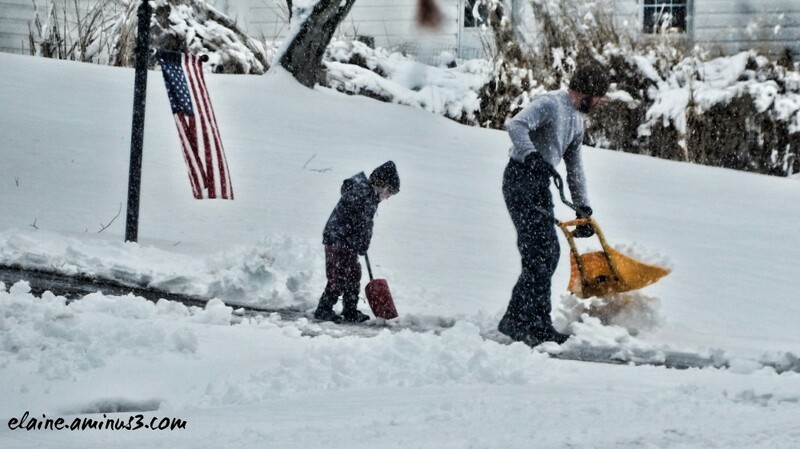 I guess its never too young to begin shoveling. How adorable. He is learning at a young age to be helpful! They need to learn early with all that snow.